Tribeca All Access announced that Cooked's mobile phone-based social media app Declare Home will receive funding along with sixteen other documentary projects. Developers' biographies and a description of the application are now available on the Tribeca All Access web page. Using Declare Home, grassroots organizers can save lives in their communities through communication, collaboration, and the creation of every-day resilience. The app provides a proactive and empowering way to foster economic and physical health within neighborhoods. Declare Home has been developed in conjunction with the documentary Cooked, an investigation into the American disaster preparedness industry's potential for fighting extreme poverty. Cooked, produced and directed by Judith Helfand, will complete post-production in 2015. 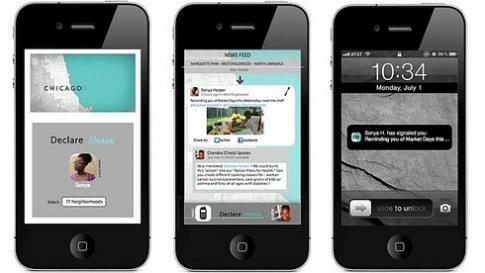 The Declare Home app was first prototyped in 2013 at Tribeca Hacks Chicago, which Kartemquin co-hosted with the Tribeca Film Institute, and the app developers received a grant from The Sundance Documentary Film Program in the spring of 2014.